In my previous post, I discussed the ship’s sonar. This time, I’ll go into more detail about the tools the Thomas Jefferson is using to complete its mission. 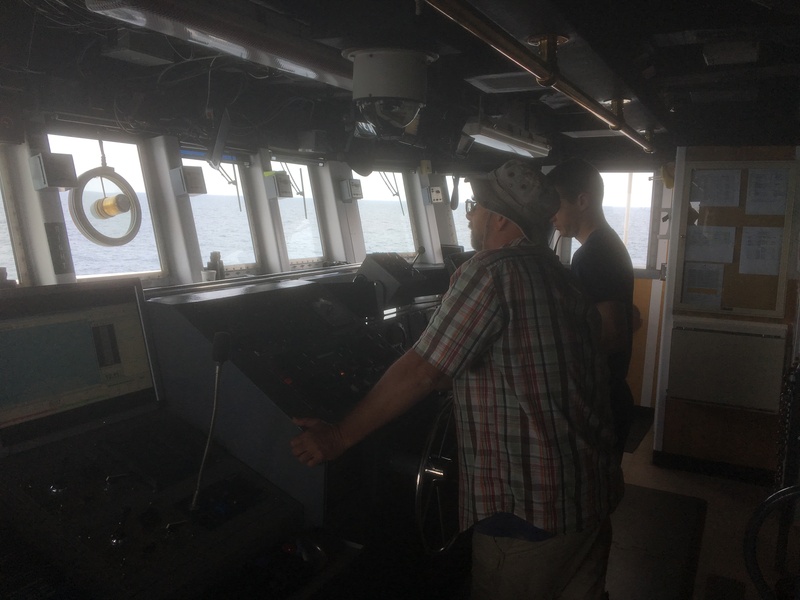 The sonar that the ship uses is multi-beam echosounder sonar, which sends the pings down to the seafloor and receives echoes in a fan shape, allowing the ship to survey a wide swath beneath the ship. 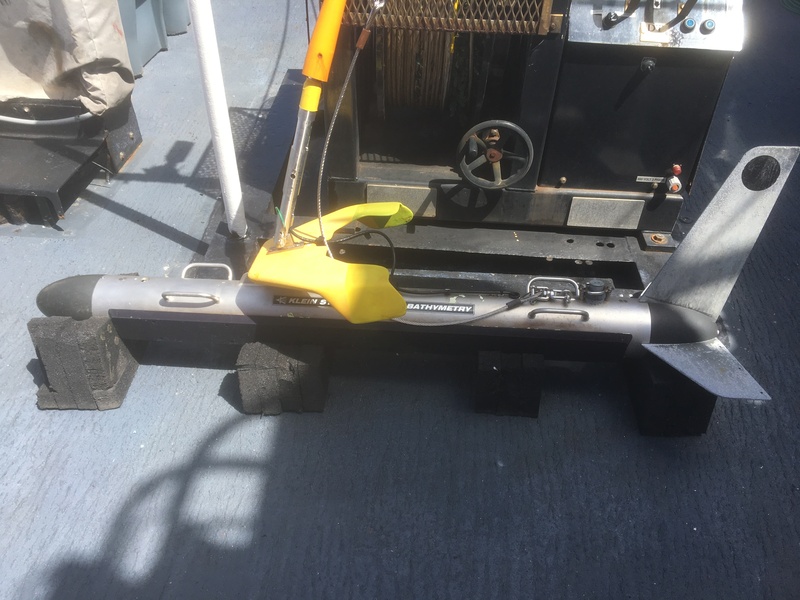 In addition to the multi-beam sonar, NOAA Ship Thomas Jefferson utilizes two towfish, or devices that are towed in the water behind the ship. 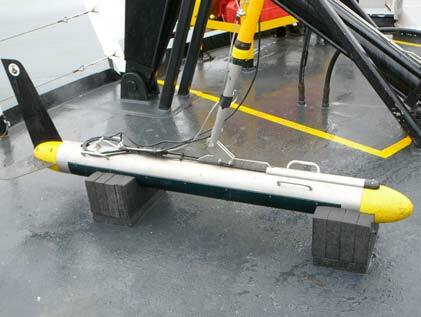 The first is the side scan sonar. Like the multi-beam, this device uses pings of soundwaves to create images of its surroundings. However unlike the multi-beam, the side scan doesn’t capture any data from the area underneath it. Instead, it collects data to its sides. The side scan is connected to the ship via a cable, and is dragged through the water 6-15 meters above the seafloor. 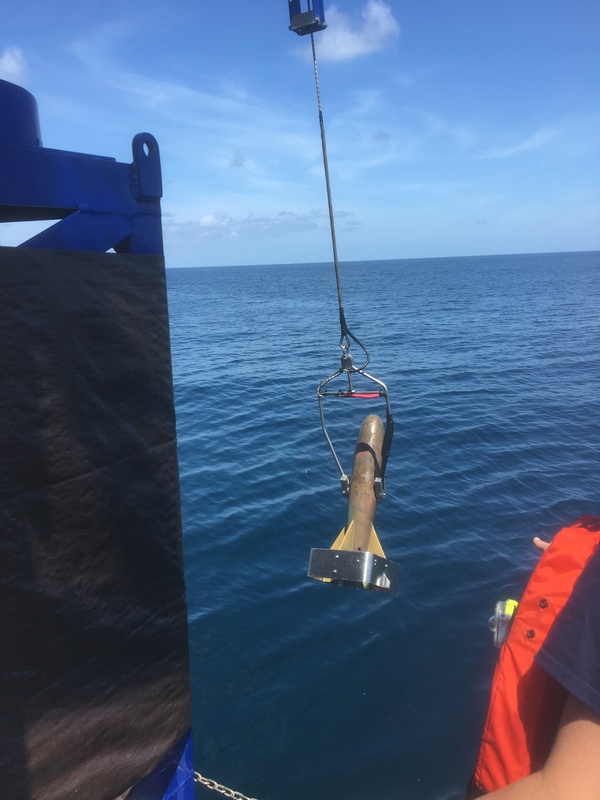 It is great for measuring the intensity of the return of the ping, which provides insights into the makeup of the seafloor. The second towfish that the Thomas Jefferson is using is the MVP (like many things on the ship, MVP is an acronym, for Moving Vessel Profiler). The MVP truly gives the ship some of its most valuable data. As I discussed in my previous blog post, in order for us to accurately calculate the distance that the sonar’s pings are traveling, we need to know the amount of time it takes them to travel, as well as the velocity, or the speed, at which they’re moving. The singarounds I mentioned in my last post measure sound velocity, but only at the face of the sonar. Water conditions are not uniform – at the surface, water tends to be warmer, with less salinity. As you get deeper, however, the water tends to be colder and saltier. This means that the velocity of sound changes the deeper you get. Most of the time, the MVP rides just under the surface of the water, but periodically it will get cast down, to approximately 1 meter above the seafloor. It measures the water conditions of the entire water column from the surface to the seafloor, allowing us to calculate sound velocity all the way down. The MVP measures the same water qualities as the CTD (a device I discussed in an earlier blog post), however, the MVP has a distinct advantage over the CTD. In order to use a CTD, the ship has to come to a stop while the CTD is lowered into the water. The MVP, however, can be used while the ship is in motion, which greatly increases productivity. When surveying, many on the crew say it’s like mowing the lawn. The ship will capture a long stretch of data, called a line, and then turn around, and capture another stretch. 4% of these lines are cross lines, which run perpendicular, across a wide swath of lines of captured data. Cross lines allow the survey department to double check that the data they’ve captured is accurate. 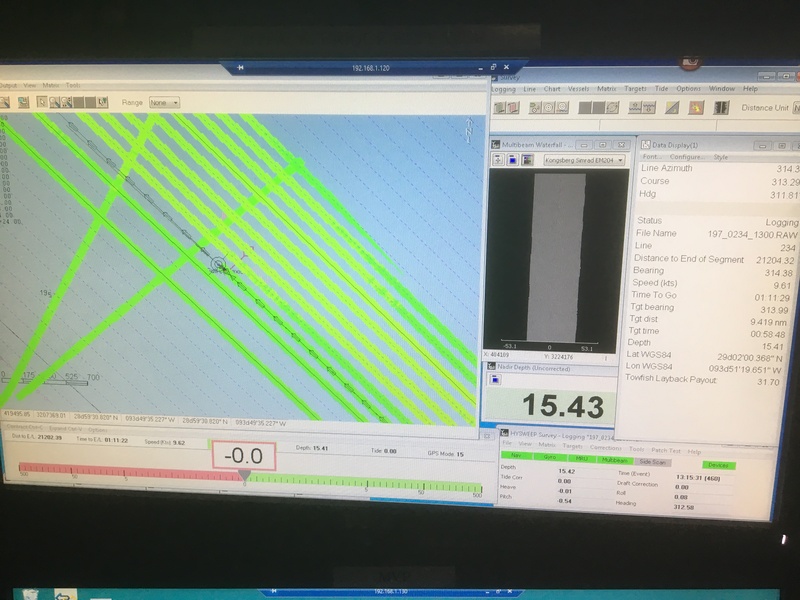 A display of the lines of survey data the ship has captured. Cross lines can be seen running perpendicular to the majority. A couple of days ago, I went up to the bridge shortly after sunset, and I was surprised what I saw. All the lights were off, and the screens of the various instruments had been covered by red filters. I was told that this is for maintaining night vision when on watch. 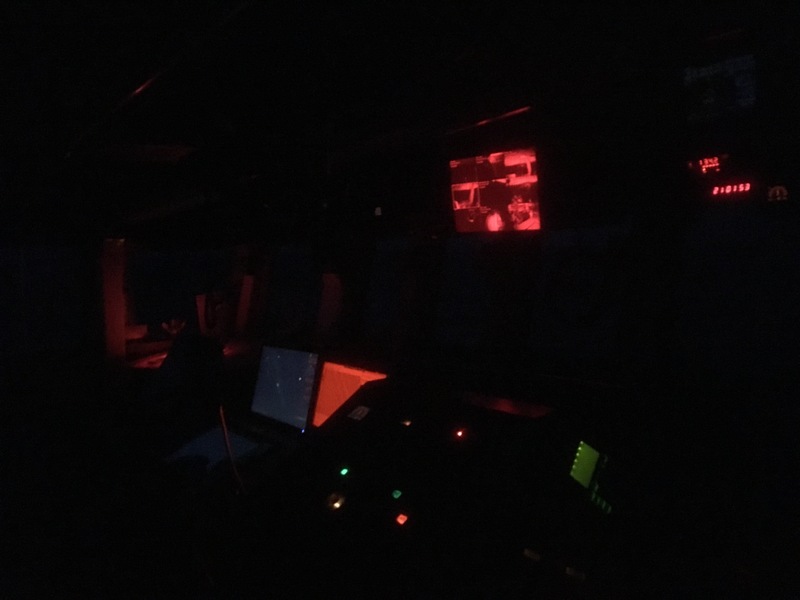 Red light interferes least with our night vision, so anything that gives off light is switched to red. While on the bridge, I had the opportunity to ask ENS Garrison Grant (who had recently been selected for a promotion to Lieutenant Junior Grade – congratulations Garrison!) a little about the NOAA Corps. I must admit that I was largely unfamiliar with them before joining the Thomas Jefferson. The NOAA Corps as we know it today began in 1970, though its roots are much older. As president, Thomas Jefferson (for whom NOAA Ship Thomas Jefferson is named) created the United States Survey of the Coast, which would later evolve into the United States Coast & Geodetic Survey. Their early operations were not unlike the survey work that NOAA Ship Thomas Jefferson is doing today, though their tools were more primitive: surveyors wanting to determine the depths of America’s bodies of water didn’t have the benefit of sonar, and instead used lead lines – lead weights tied to the end of ropes. These surveyors would also play a vital role in our military history. They would often assist artillery, and survey battlefields. This is what led to the United States Coast & Geodetic Survey (and later, the National Oceanic and Atmospheric Administration) to gain a commissioned uniformed service. Due to the rules of war, captured uniformed service members could not be tried as spies. To join the NOAA Corps today, you need to first have a bachelor’s degree. ENS Grant received his degree from Stockton University in Marine Sciences, but he says that it isn’t a requirement that the degree be in a maritime field. He says that some of his classmates had degrees in fields such as English or Communications. After getting a degree, you then apply to join the NOAA Corps (anyone interested should check out this website: https://www.omao.noaa.gov/learn/noaa-corps/join/applying). If selected, you would then complete the Basic Officer Training Class (BOTC), which generally takes about 6 months. After that, you’d be given your first assignment. 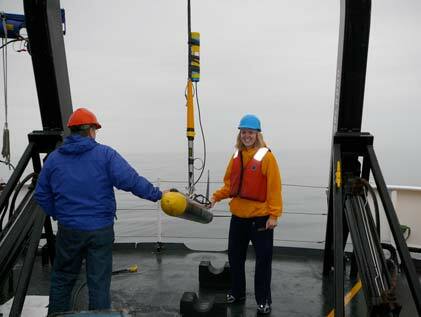 Today the crew worked on deploying several devices that work to collect information about the ocean floor. Together with the fisheries department, the FAIRWEATHER is able to gather information about the layout of the ocean floor and the substrate itself which helps them better understand what type of fish live in what area and what kind of habitat they prefer. For example, it may be known that a certain fish whose existence may be threatened and protected lives in a specific area. Therefore it is important to protect that area. With the new information that is being collected, we can tell what the bottom habitat looks like and then also work to protect not just specific locations in the water, but also specific habitats. This large torpedo-like device is called a towfish. 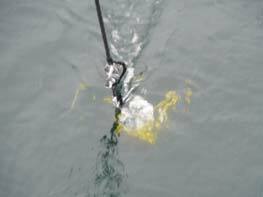 It is dropped into the water behind the ship to collect pictures of the ocean floor. Teacher at Sea Lisa Kercher assists in bringing it back to deck. I was able to help in deploying and retrieving several of the instruments used today. While it was cold and rainy, the learning experience outweighed the negatives in the climate. It is great to be out learning what goes on in the research aspect of the science field, rather than just within the classroom! 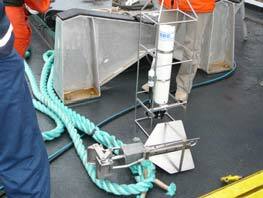 The penetrometer has been deployed into the water to collect information about the consistency of the ocean floor. I was told that there were many sea otters surrounding the ship last night. The water was also full of kelp. Why might the two of these organisms be found in the same location of the water at the same time?